Objective secured, Deathwing are victorious again. I don't usually write post titles that aren't explanatory... I don't like them. But in this case, it fits perfectly. The post title is from a movie and the idea here is that any army can win against any other army on any given day. Right, I know, I know... but what about this and what about that and you forgot to consider this and that and blah blah blah. I believe that any army can win against any other one. What matters is how it is played. I do it again and again with my army. It's not that I have plasma guns on my Sergeants, those haven't helped me yet and haven't turned the tide of any game to be honest. 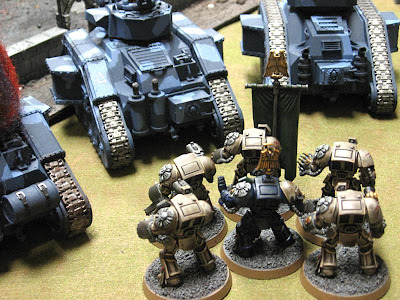 It's that my wins come against players that don't know their army as well as I know mine. It's not that my list or build is tougher than theirs, it's that I make less mistakes with mine and I know my army better than they know theirs. I played against a Guard player the other week and ended up pulling out a win. Just like my win against Blood Angels a few weeks earlier, both guys are still learning their armies. The Blood Angels player actually plays Orks really well. Why? Because he's been playing them forever and knows how to use them. He doesn't know how to use Blood Angels yet. If he stays with them (Blood Angles) and learns how to play them, he can do just as well with them as he does with his Orks... I know it can be done. He DOES NOT need to have what the internet says he has to have in his list to win, he can do it if he spends the time learning how to use the units he wants to use. And the same goes for the Guard player. And the same goes for all players. My wife always tells me that non descriptive post titles or cute ones hurt your posts chances to be found when searching on google. I am sure anyone/anyday could beat me with my marines as I get to play them so infrequently. Great point Ron, too often I've heard criticism of various armies in that you need such and such to win etc. What they really need is to know thier armies. It always bothers me a bit when I hear that at the game store. I just keep my mouth shut unless someone asks my opinion and always ensure that they know it is an opinion and thier results may vary. And that's the reason I always build my lists with units I want in there or I want tolearn how to use. Using a copy-paste Netlist is not a sure autowin, since skill is a big part of the game. I agree whole-heartedly with what you are saying here Ron. It is easy to get trapped in the cookie cutter lists that can be found around the net if you are new to the hobby, indeed we can all fall for it. Taking the time to learn your army, paint it and use it to its potential can yield more that just more wins tho. Couldn't agree more. I have a friend whom I usually only beat when he's learning a new codex, be it a new army or an existing. He's a skilled player but experience is crucial too and without it I take my few and far between wins against him. Completely agree! (Except on the blog titles - I love to do really vague ones that I know only a select number of gamer-geeks or film buffs will understand...) But anyway, it's not just knowing your own army, it really helps if you know your enemy's army as well - after all, what better weaknesses can you expose than the ones you've fallen foul of yourself? As for cut-and-paste army lists, I just don't understand why people bother! Just put the troops in your army that you love, and play with them in the style that they would fight on the battlefield and - win or lose - you can't go wrong. All good points, I am starting a new army myself and agree with what has been said. Sure its a good idea to read these internet lists so you know what is floating about but it is better to have your own list. It takes time and patience to learn how to properly use your army, but thats a fun aspect of the hobby. Agreed. It really helps to know your wargear as well, and know it on the fly so you can use your army to the best of its ability. Since I play Tau and DA i need to squeeze as much firepower into my turns as possible while minimizing losses. Also it wasn't until after my third game using sniper drones that I realized they had stealth fields, and I always forget to give kroot their proper cover save in forests! Actually, its not as much any given ARMY, but in reality any given PLAYER...as, that is the biggest variable out there. Sure, some armies are a better match than others, but as some boards say...you can only blame the dice for so long. Amen. Well said, man. Not much more needs to be added. 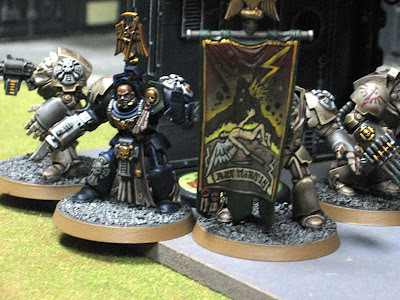 Is one of the Terminators painted black with blue highlights? Can someone give a quick run down of painting a model to look like that Terminator? Brad: That's my failed Librarian. He's primed light grey and then given a series of Asurmen Blue washes and then highlighted with slightly lighter shade of blue.